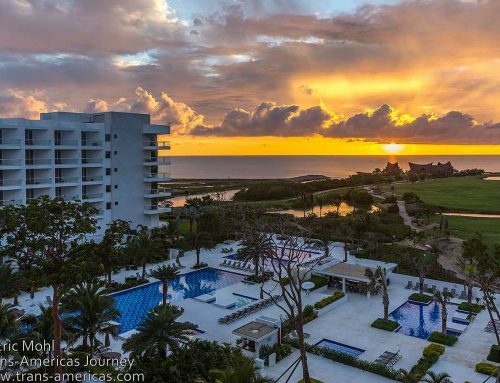 A snazzy new road means you can now travel from Panama City to the Caribbean Coast in two hours. 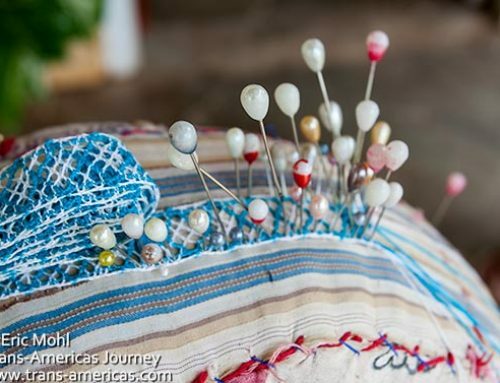 This easy access has brought renewed talk of improving tourism infrastructure in this lightly visited area of the country but, as we found out when we visited Puerto Lindo and Portobelo, that’s largely still just talk. Puerto Lindo means “beautiful port” in Spanish, but it wasn’t. The slim, grey beach in Puerto Lindo was littered with trash and the pier was ratty and occupied by locals who failed to return our greetings. School seemed to be permanently out. Sitting around was the preferred day job. There are two places to stay in Puerto Lindo and the least bleak of the two, creatively named Hostel Puerto Lindo, turned out to be a filthy, neglected place ostensibly managed by a lazybones named William who kept asking us for money. The sheets, pillows, floors, shower, and hammocks were tacky with a mysterious greasy film. The foam mattresses were too frightening to contemplate. The communal kitchen was a Petri dish. At least the fan worked, but at US$7 per person it was a rip off. 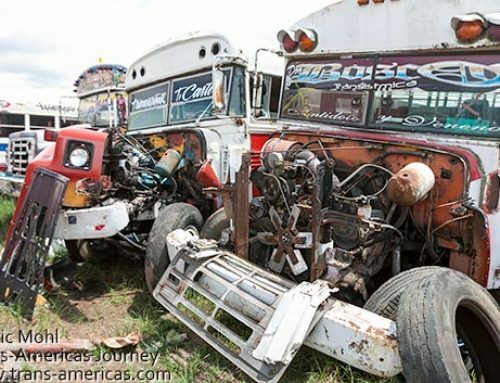 Hell, at US$2 per person it was a rip off. 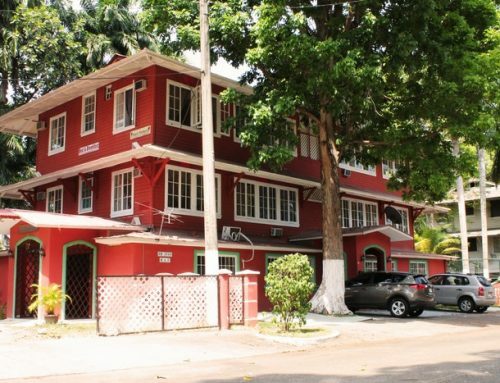 That’s when it dawned on us that everyone “working” at Hostel Puerto Lindo was male and we vowed never to say in a hostel with no woman on staff again. Ever. Impressively creepy devil masks like these are made by craftsmen in Puerto Lindo to be worn during the annual Diablos y Congos (Devils and Slaves) festival held on Panama’s Caribbean Coast. 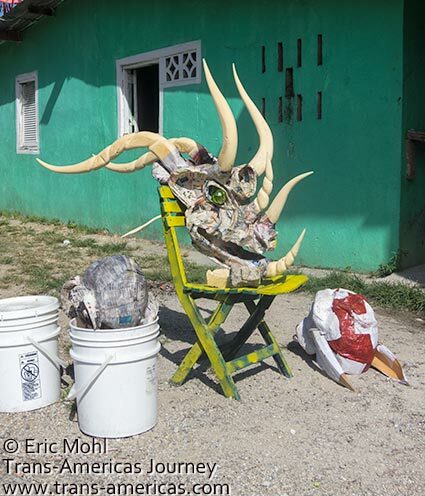 The next morning we tentatively poked our heads into a few nearby homes where men were creating impressively ghoulish masks which are worn during the dramatic, wild, Diablos y Congos (Devils and Slaves) festival which is held on the Caribbean coast after Carnival. Then we fled to nearby Portobelo, 9 miles (15 km) away, hoping that it better resembled its name which also means “beautiful port”. We didn’t even bother seeking out the “sloth lady” of Puerto Lindo that we’d been told about. Yep. 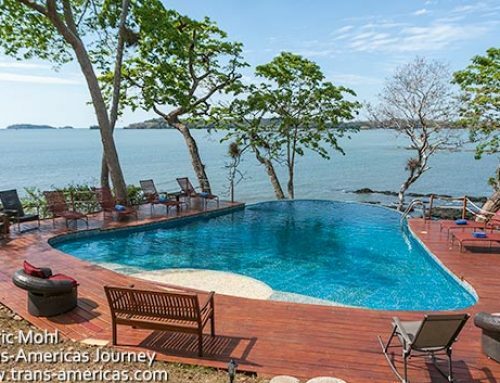 Not even sloths would keep us in Puerto Lindo. 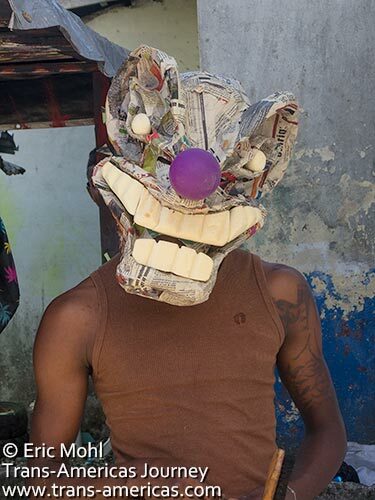 A mask maker in Puerto Lindo shows off his art in progress. Compared to Puerto Lindo, Portobelo is a metropolis albeit a garbage strewn, ramshackle one with occasional shootings in the street like the one that occurred shortly after we arrived in which someone named “Oaky” was gunned down for allegedly stealing drugs from a cartel in Colon. 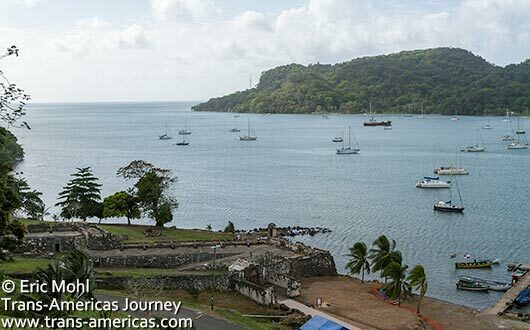 Portobelo harbor and the remains of the Spanish-built Santiago Fort. 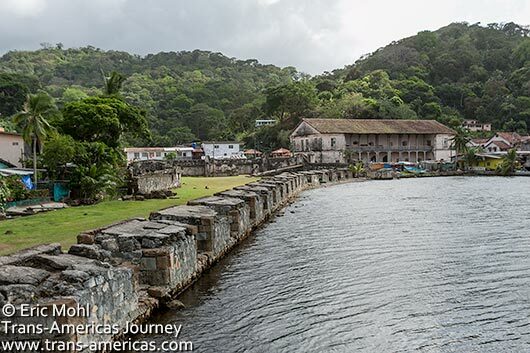 The most famous place in Portobelo, by far, is Captain Jack’s hostel, bar, restaurant, and tour company which is owned by a US expat who now simply goes by the moniker “Captain Jack”. He appears to be loved and reviled in equal measure, as all pirates should be. We did not stay there (Captain Jack doesn’t offer private rooms) but we did have a decent US$7 hamburger with the best fries we’d had in years (hand cut with the skin still on). 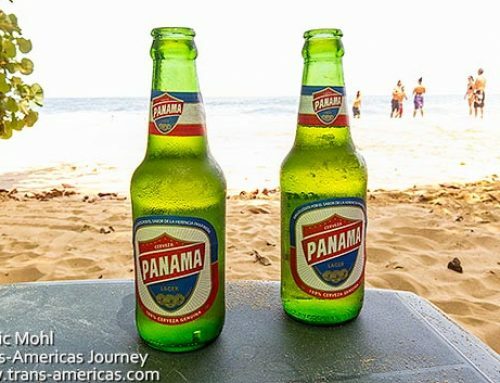 The open air bar/dining area also had Wi-Fi and that, coupled with the good food, cold beer, and generously poured rum drinks, conspire to create an irresistible magnet for every foreigner in Portobelo and, it turns out, there are many. 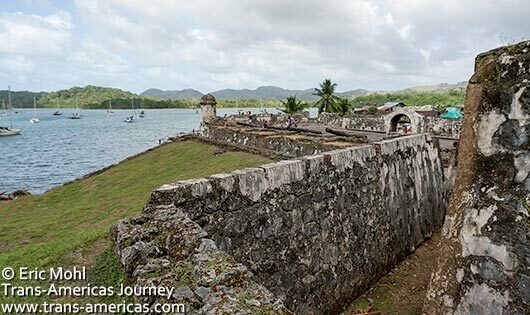 The Spanish built the San Jerónimo Fort in Portobelo, Panama to protect the harbor from pirates who were after the plundered gold the Spaniards hoarded in town before sending it back to Spain. 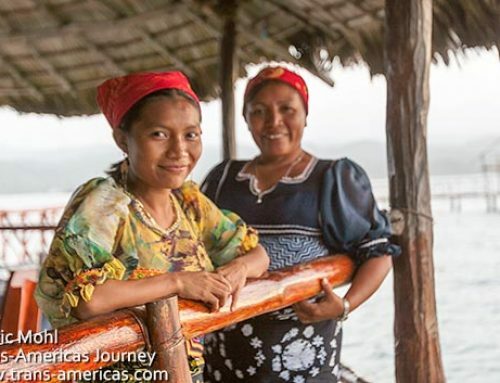 Among the “yachtie” community–an international group of people who live part or all of the year on their boats (which are very, very rarely yachts)–Portobelo is a popular, well-known port for repairs and re-provisioning. Yachties are not traditional travelers. They’re not expats. They’re a breed all their own – boisterous, boozy, a little bit snarky. 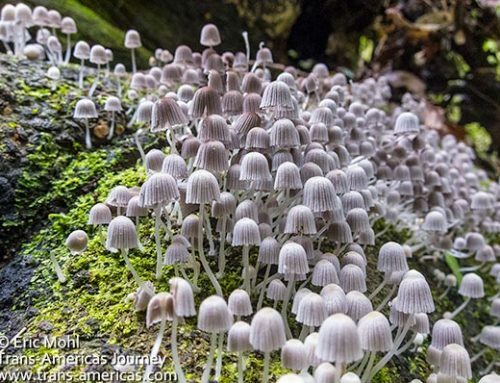 Some of them have the distinct air of being on the lam. 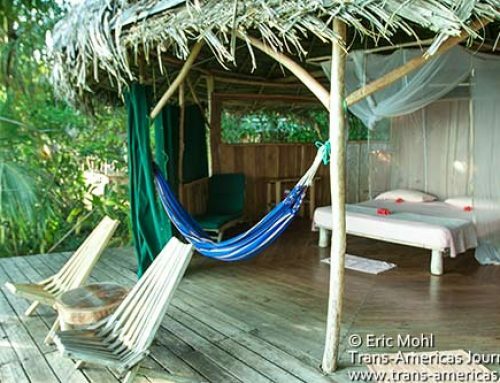 Some boat owners offer sailing trips through the San Blas Islands and the talk in town often revolves around departure dates, prices and which boats have sunk lately as backpackers try to book the best passage. 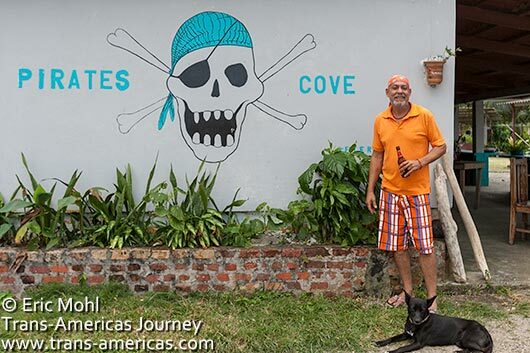 Pirates Cove and its gregarious owner Tommy. With Captain Jack’s out of the running for accommodation, we headed to a place down the road called Pirates Cove behind the police station just off the main road. It’s run by a gregarious Panamanian named Tommy, fresh back from years in the US, who was doing his best to improve the run down rooms which had saggy mattresses, weird drop ceilings, dirty showers, and ill-fitting polyester sheet with cigarette burns in them when we were there. You can’t beat the waterfront location, however, and we are hopeful that Tommy has made some improvements by now. The outdoor bar at Pirates Cove is another yachtie magnet and good place to meet captains and get information about San Blas sailing trips. 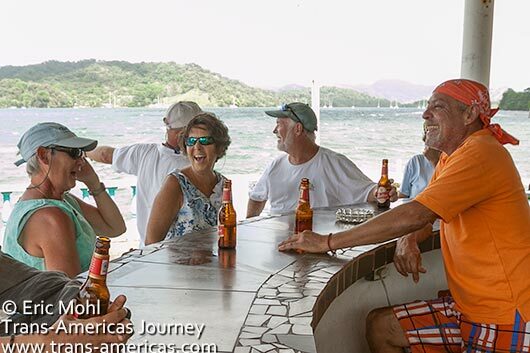 The easy-going waterfront bar at Pirates Cove is a great place for a cold one and for getting information from boat owners about San Blas Island sailing trips. In between the cheerful open air restaurant and the blocks of rooms at Pirates Cove you’ll see a strange area of shallow cement troughs mostly filled with sea water. Look closely and you’ll see that the water is covering (and, therefore, protecting) rows of cannonballs, tiny cannons and even wood beams. These items, we were told, are believed to be bits and pieces from one of Christopher Columbus’ ships (more on him later) which sank near Portobelo in the early 1500s. The 1500s, people! Others believe the remains could be from the wreckage of a pirate ship operated by Sir Francis Drake. 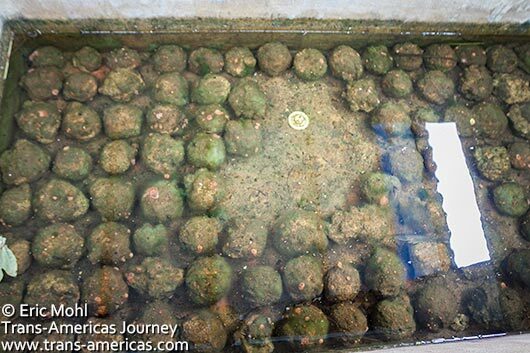 This concrete trough full of sea water on the property of Pirates Cove holds what could be cannonballs from one of Christopher Columbus’ ships. This apparently important booty is just sitting there soaking until restoration and preservation experts can verify the remains and figure out what to do with them. Christopher Columbus founded “Puerto Bello” in 1502. 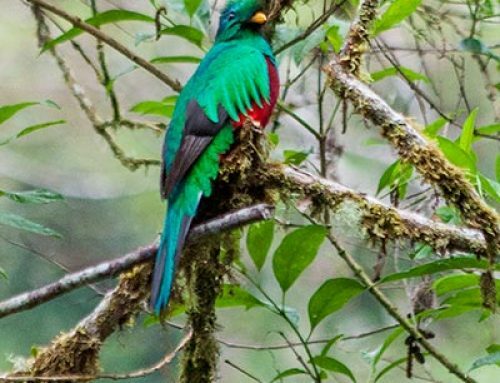 The tiny town was re-named San Felipe de Portobelo by Spanish colonizers in 1586 when they took the town and its strategic port. 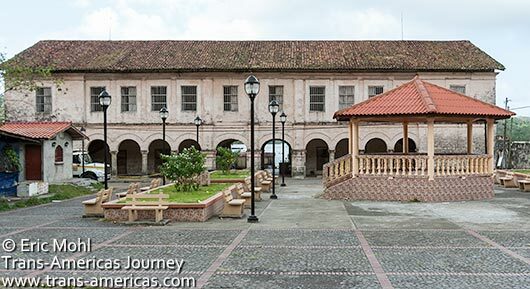 The Spanish built the San Felipe Fort, San Diego Fort, San Jerónimo Fort and the Santiago Fort to defend the port, and the plundered gold stored in the local Customs House. Portobelo was a primary ports for shipping stolen gold from the “New World” back to Spain and it suffered a long line of attacks from pirates, including Henry Morgan who trashed Portobelo in 1671. 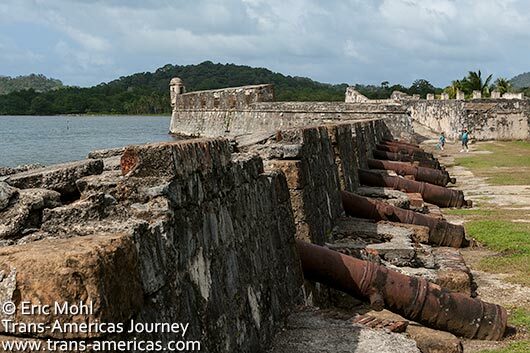 San Jerónimo Fort in Portobelo, Panama had 18 cannons but even that wasn’t enough to stop pirates from taking the town and the stolen gold the Spaniards amassed there. San Fernando Fort, San Jerónimo Fort, and Santiago Fort still stand and can be visited. San Fernando is across the bay and you can hire a boat for a few dollars to take you across to it. On the western end of Portobelo you’ll see Santiago Fort (free) wedged between the road and the bay. It’s worth a wander around. San Jerónimo Fort (also free) is essentially in the middle of Portobelo. Santiago Fort in Portobelo, Panama. In 1980 the forts in Portobelo were inscribed as a UNESCO World Heritage site as “magnificent examples of 17th- and 18th-century military architecture.” In 2012 the forts were placed on UNESCO’s List of Heritage in Danger because of a “lack of maintenance and uncontrollable urban developments” but they’ve since been reinstated. The hulking Customs House in Portobleo and the fortified wall along the harbor. Even today, the Customs House in Portobelo, where the Spaniards’ beloved gold was stored, stacked, and counted before being shipped to Spain, is by far the largest and most imposing structure in Portobelo. It’s huge rooms now often house changing exhibits of local art and history. 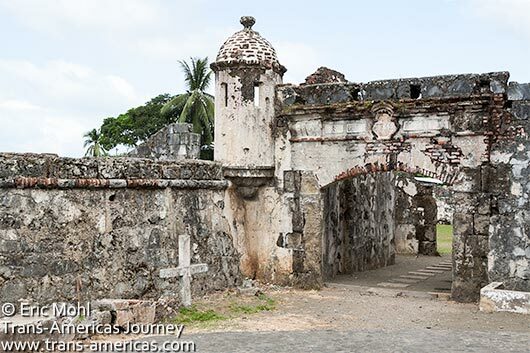 Spanish colonizers stored and counted their stolen gold in the Customs House in Portobelo, Panama before shipping it off to Spain – if the pirates didn’t get it first. 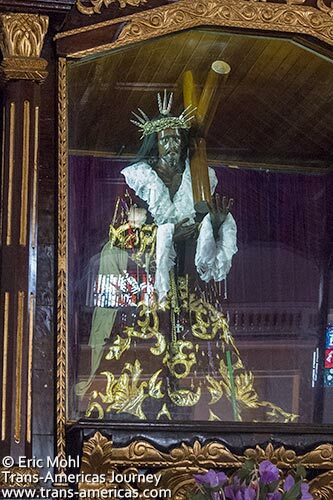 Its also worth visiting the nearby San Félipe Church to check out the 4 foot (1.5 meter) tall statue of the Portobelo’s famous black Christ. Various legends surround the statue but a common element to the story is that a large box mysteriously appeared in Portobelo and when locals opened it the black Christ was inside. 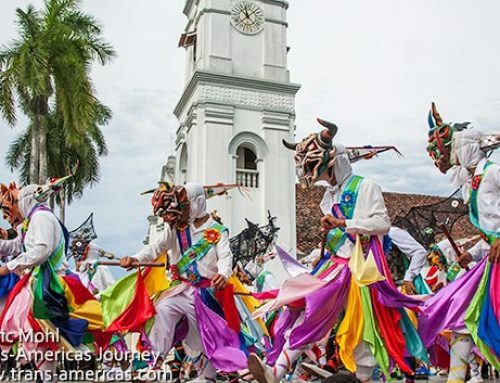 Every October 21 the town hosts a festival which draws pilgrims from all over to help carry the statue around town, then drink and dance until dawn. 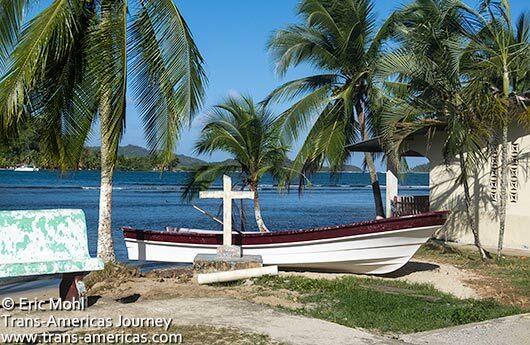 Portobelo’s San Félipe Church is home to his black Christ, subject of much legend, a few miracles and an annual festival. 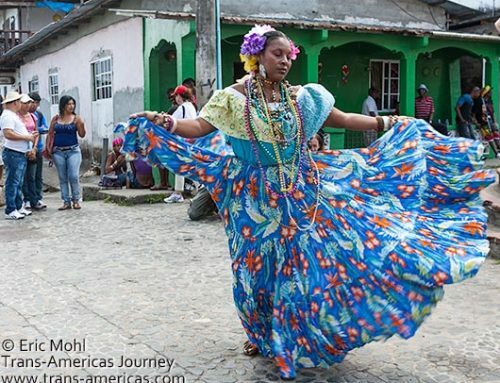 Oh, and be aware that the wind in Portobelo can be epic, especially in January and February. 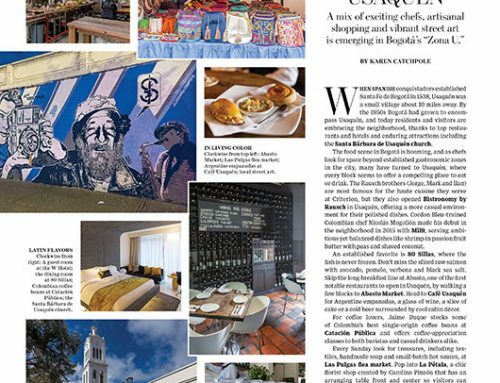 Wow, there is some serious history on display in these unassuming Panamanian towns … thanks for the warning about Hostel Puerto Lindo, as I might end up in those parts in the next couple of months in my travels through Central America! 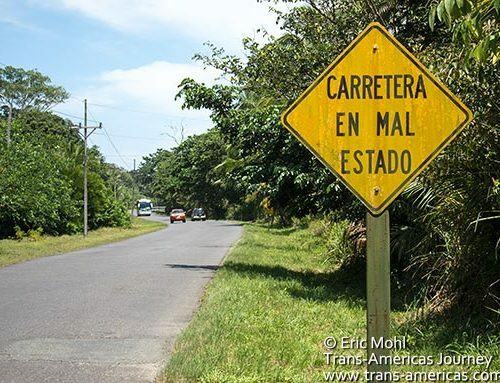 So helpful and thank you for the warning on Puerto Lindo. I’m travelling alone with my camera so I’m not exactly not going to stand out as an African woman. I’ll have a search for Privates Cove. And the epic winds warning is seriously helpful! Would it be possible to get a guide somehow?